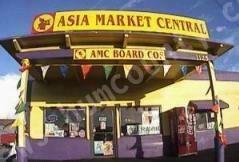 The Asia Market Central just across Summer Street from the main Post Office in Eureka (Summer & Clark) is on the market! Asia Market Central is supposedly the largest import Asian grocery and general store in Humboldt County, and is being sold for unknown reasons. Given the very high crime rates in the area of the main post office, its owners may simply be fed up with life in the ghetto and ready to move on the bigger and better things. Mandy Keen, a transient who was found loitering at the bus stop across the street from Asia Market Central over the weekend, said she will miss the pretty colors and high traffic if the market closes down. Mandy may not need to worry, however, because the Market's central location practically ensures it will continue to operate successfully for years to come if purchased by a competent business owner. Asia Market Central Still Open for Business!